From storing online to making hard copies, there are many ways to preserve digital photographs. I used the free photo sharing site Flickr for a long time. It’s where I uploaded most of my photos over the past 14 years. But then I got an e-mail from Flickr threatening to delete my pics unless I was willing to pony up $50 a year. So I looked to see how many pictures I had on Flickr. I logged in and scrolled through more than a decade of memories: snapshots of my road trip to Van Buren, Maine; my visit to the “Goonies” house in Astoria, Ore.; vacation adventures in Hawaii, Miami, New Orleans . . . so many memories. All told, there were nearly 7,000 images and videos chronicling my travels, and Flickr was holding them for ransom. A red box appeared on my computer screen. It was a message from Flickr, reminding me that from now on their free accounts would be limited to 1,000 photos or videos, and unless I paid up, my account would be purged on Feb. 5. It was a not-so-gentle reminder that online cloud services can change their pricing at any time — or go out of business entirely, and take all your precious photos with them. Just because you’ve uploaded your latest pics to Facebook, Flickr, or any other website doesn’t mean they’re safe, according to Sara Day Thomson, a spokeswoman for the Digital Preservation Coalition, a UK-based nonprofit that’s dedicated to safeguarding digital content. Read: You went on vacation and took thousands of photos. Now what? Here’s how to organize them. “Holding all this data is expensive for platforms — keeping those massive servers up and running is a huge expense,” she said. The bottom line: They don’t have an incentive to hold onto your photos if they’re not making money. “These conditions make your social media content very vulnerable to loss,” she said. So what can you do to make sure your travel photos and other digital keepsakes survive for the next generation? There’s really only one solution: Download everything from your social media accounts. That’s what I ended up doing with my Flickr account. Instead of forking over 50 bucks, I chose to download all of my photos and videos. Thomson says you should do this with all of your social media accounts. Facebook, Twitter, Instagram, and Google all offer the option of downloading your data (just log in and go to “settings,” and you’ll be on your way to preserving your digital legacy). After you download your stuff from each account, make a backup copy. And then make this a regular habit. “Social media marketing professionals or other highly active users should download their data every three to six months,” said Thomson. For more casual users, downloading every six to12 months should do, she said. “Just set a reminder so you don’t forget,” she said. When it comes to social media, another thing to keep in mind is photo quality (or lack thereof). Every time you share a photo on social media, the chances are good that your image is getting compressed. Facebook automatically resizes and reformats every photo, which reduces the quality of the image. But there is a way to upload higher resolution images and videos to Facebook. If you’re using Facebook’s mobile app on your phone, go to the account settings and choose to upload photos and videos in HD. To do this on an iPhone, tap the menu button at the bottom right of the screen, scroll down and tap “settings and privacy,” then choose “settings.” Scroll down to “media and contacts” and then open “videos and photos,” and make sure the “upload HD” button is switched to green. You should always keep multiple copies of your important photos in different locations. That means if you have a photo on your phone and a copy living in the cloud, you should back it up on an external hard drive or thumb drive, too. But as time goes on, you’ll need to update those back-ups. Don’t wait to move your files off of an old thumb drive — take the time to transfer them to a new device while you still can. If you’re using an external hard drive that’s three to five years old, it’s probably time to upgrade, according to Thomson. And don’t forget to label your storage devices. Take it from me: you don’t want to end up with a drawer full of unidentifiable USB drives. Write up a cheat sheet that describes what each drive looks like and what it contains. Trust me, you’ll thank yourself later. Brian X. Chen is a consumer technology reporter and author of the Tech Fix column for The New York Times, and he’s tried out several different ways of managing smartphone photos. When it comes to cloud storage, he recommends using Google Photos to back up pictures. He says it’s also an easy way to organize your pics. There are plenty of other cloud storage options out there, too (such as iCloud, Dropbox, OneDrive, Amazon Drive, Box, or MediaFire). Just make sure you read the fine print, because pricing and restrictions on storage can vary, depending on which service you choose. For example, Snapfish allows unlimited storage for your photos, as long as you purchase at least one Snapfish product each year (it could be a single 4x6 print — which is not a bad deal, as long as you remember to do it). Shutterfly, on the other hand, also promises free unlimited storage, which sounds great, until you read their fine print, and realize they don’t offer full-resolution downloading. Even if you find the perfect cloud storage solution for your needs, just remember that the services offered by these companies can change at any time, according to Thomson. Another way to preserve your favorite photos is to go old-school, and make hard copies that you can actually hold in your hand. And you don’t have to spend much to print your photos the old-fashioned way, either. Snapfish, York Photo, and Walmart have prices that start as low as 9 cents per print. Slip the prints into an album, pop a couple in frames, or make a collage. Another creative way to preserve your vacation remembrances is to put them in a photo book. Snapfish, Shutterfly, and Google are among the many companies that offer easy templates that you can use to design your own custom photo books. Be sure to take advantage of sales, too — Snapfish and Shutterfly regularly offer discount codes that can save you a bundle. Put all your favorite photos from 2018 into one book, and you’ll have a year of your travels nicely organized. Then make it an annual tradition. 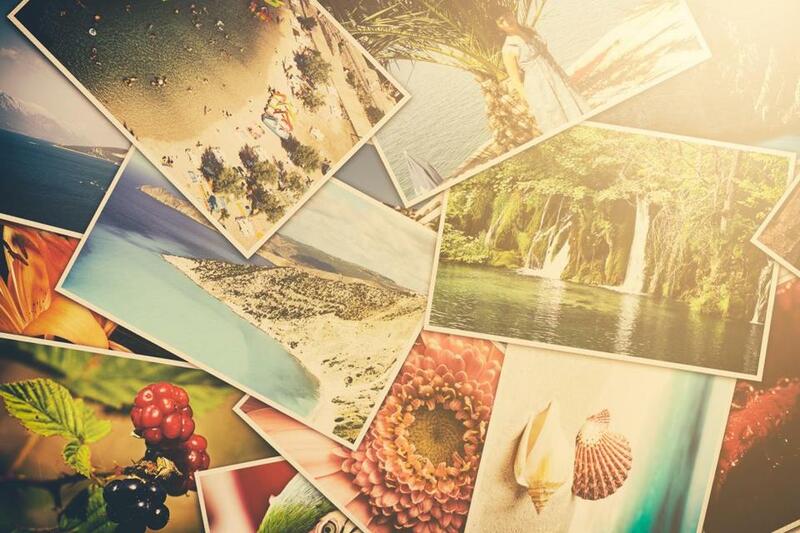 It’s a fun way to make sure your vacation memories are preserved for many years to come.